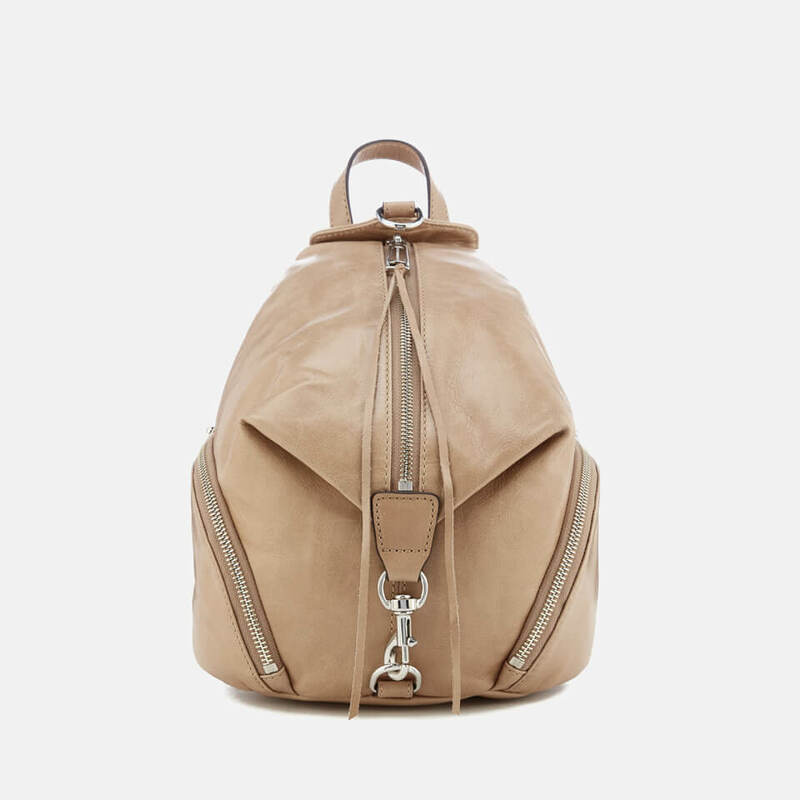 Women’s tan convertible mini backpack from Rebecca Minkoff. Crafted from ultra-soft, smooth leather, the ‘Julian’ rucksack comprises a unique vertical zipped fasten and dog leash clasp closure that opens to reveal a lined main compartment and interior zipped and pouch pockets. Two diagonal external zipped pockets to the sides and a slip pocket to the reverse provide additional storage. Constructed with two adjustable shoulder straps and a top handle for versatile carrying options., the versatile bag is accentuated with silver tone hardware and elongated leather zip pulls. Finished with a brand-embossed metal plaque to the rear. Leather Dimensions: H: 24.5cm x W: 20.5cm x D: 11.5cm Model is 174cm/5'8.5 . 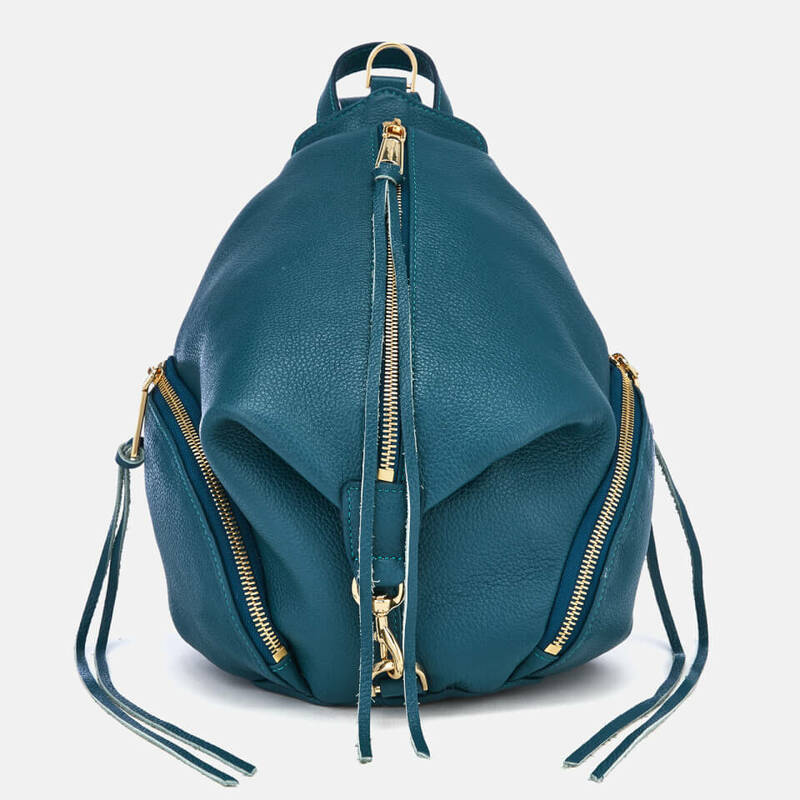 Women’s mini convertible backpack from Rebecca Minkoff. Crafted from nubuck leather designed with a silver glittery star print throughout, the ‘Mini Julian’ rucksack comprises a unique vertical zipped fasten and clasp closure that opens to reveal a lined main compartment and interior zipped and pouch pockets. Two external zipped pockets to the sides and a slip pocket to the reverse provide additional storage. Constructed with two adjustable and detachable shoulder straps, and a top handle for versatile carrying options. Accentuated with gunmetal tone hardware and elongated leather zip pulls. Finished with a brand-embossed metal plaque to the rear. Nubuck Leather Dimensions: H: 23cm x W: 16cm x D: 10cm Model is 176cm/5'9.5 . Die Handtasche von Rebecca Minkoff ist aus fein genarbtem Leder gefertigt. Sie verfügt über ein verschließbares Hauptfach und zeigt sich mit langen Zierquasten und abnehmbarem Schulterriemen. 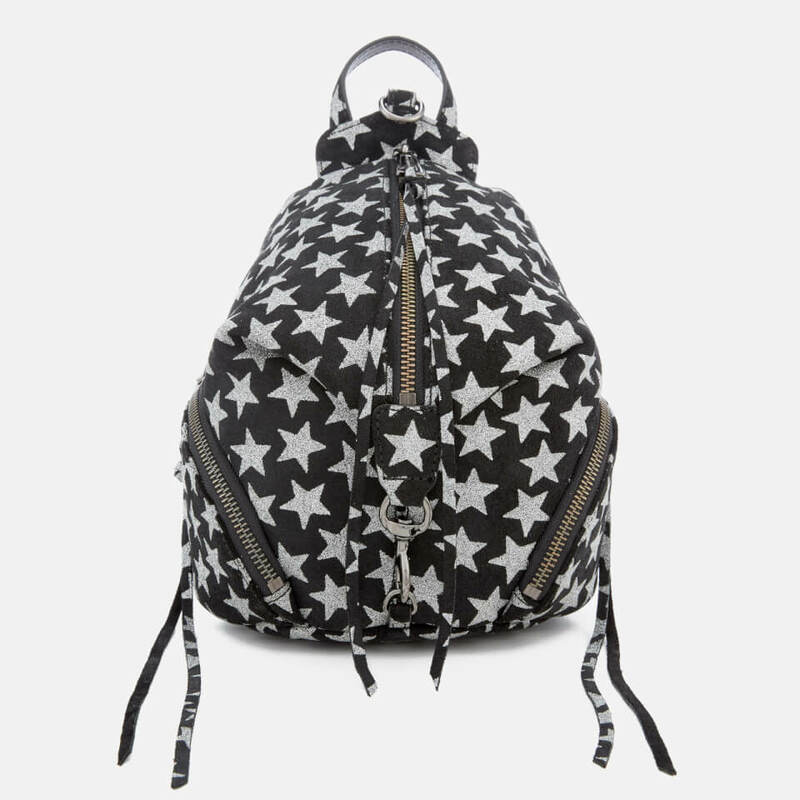 Women’s medium backpack from Rebecca Minkoff. Crafted from ultra-soft, smooth leather, the ‘Julian’ rucksack comprises a unique vertical zipped fasten and dog leash clasp closure that opens to reveal a lined main compartment and interior zipped and pouch pockets. Two diagonal external zipped pockets to the sides and a slip pocket to the reverse provide additional storage. Constructed with two adjustable shoulder straps and a top handle for versatile carrying options, the versatile bag is accentuated with gold tone hardware and elongated leather zip pulls. Finished with a brand-embossed metal plaque to the rear. Leather Dimensions: H: 24.5cm x W: 20.5cm x D: 11.5cm Model is 174cm/5'8.5 . 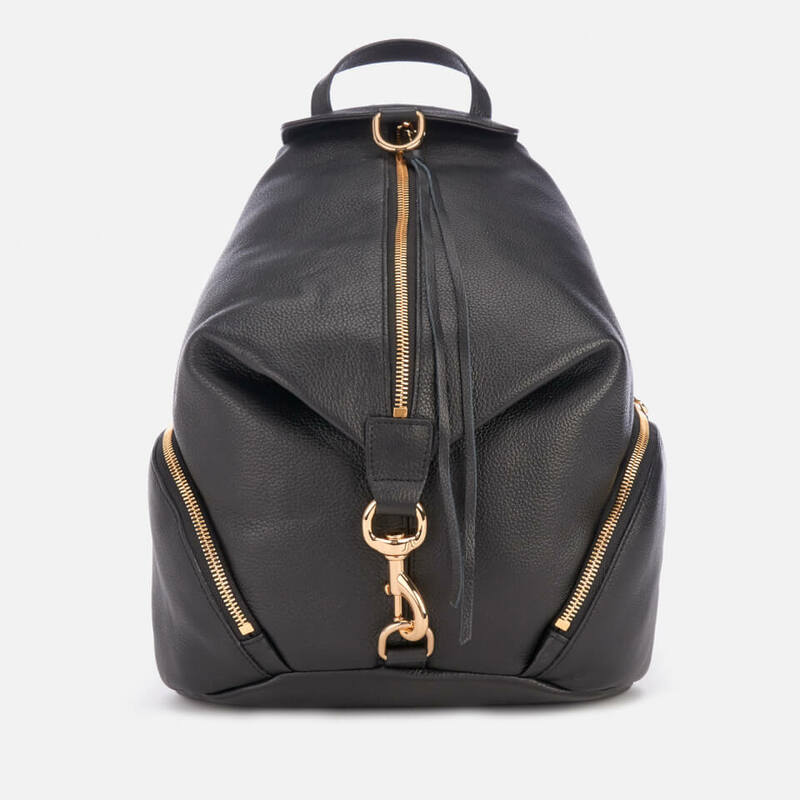 Women’s medium backpack from Rebecca Minkoff. Crafted from ultra-soft, smooth leather, the ‘Julian’ rucksack comprises a unique vertical zipped fasten and dog leash clasp closure that opens to reveal a lined main compartment and interior zipped and pouch pockets. Two diagonal external zipped pockets to the sides and a slip pocket to the reverse provide additional storage. Constructed with two adjustable shoulder straps and a top handle for versatile carrying options, the versatile bag is accentuated with gold tone hardware and elongated leather zip pulls. Finished with a brand-embossed metal plaque to the rear. Leather Dimensions: H: 32cm x W: 26cm x D: 15cm Model is 174cm/5'8.5 .